Just about every pagan and polytheistic tradition active at this time have a love for candles. Those flickering flames can set an otherworldly mood perfect for ritual and can fuel their own magic. They are also cheap and ubiquitous. So, no problem right? A quick trip to IKEA, buy a pack of tealights, and you’re good to go. Did you ever consider why those candles are so cheap? The answer comes down to three little letters: oil. Paraffin-based candles are all made from oil. They are big business and have a huge environmental impact. 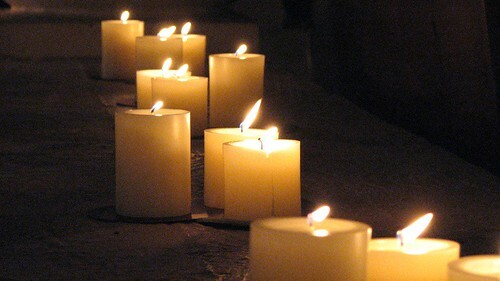 Back in 2001, the Environmental Protection Agency released a report about the impact of burning candles in the home. (source) Burning these candles can create a toxic environment in the house and wreak havoc for anyone with respiratory issues. Plus wicks in these candles often contain lead. Sometimes it seems like a person just cannot win in these matters. So what can you do? A few weeks back my good friend Sufenas wrote up e’s own post on such matters though I do not know if e is aware of the reason why candles are so specifically toxic. You do not have to burn candles for all your rites, that is for certain. In my own case this is not as much of an option, as the Kemetic Orthodox rite of Senut includes a lighting portion of the rite, either with candle or oil lamp. There are safer candles out there. Beeswax candles do not emit the same kind of chemicals as paraffin wax candles do. And while I have yet to find any formal studies, there are anecdotes available online from those who have found the candles may even benefit people with asthma and allergies. During this year I have made a conscious decision to switch over as many candles as I can to beeswax. The cost is a factor and I will not try to deny that. However, as some of my practices do involve candles on a regular basis and I can afford to do so, I will buy them. I also see it as another way to support real beekeeping, since the wax would not be available otherwise. To be fair though, I have not made a full switch in candles. Since some of my practice includes serving the lwa and some hoodoo, I have yet to find a good replacement for glass-encased candles. In fact, it was because of hoodoo that I first became aware of the base material. When the price of oil began to spike up in the mid-2000s, those of us in Miss Cat’s hoodoo course were told that the prices of her candles would be going up for this reason. You can also use soy wax candles, but as I am not a fan of soy in the diet I tend to stay away from the candles too. In this case it is your choice. They would most likely be much easier on your home’s air quality than most candles. This entry was posted in Uncategorized and tagged candles, greening your magics on July 28, 2013 by syncreticmystic. One of my values, as a Pagan leader, is to make rituals and spiritual experiences that are accessible and inclusive. At least–as much as I’m able to. I talk to a lot of Pagans who vehemently agree with this concept…and who then present rituals that–for various reasons–are not very accessible or inclusive. Their rituals may present difficulty for people with mobility challenges. Or the rituals may not really be inclusive of gay, lesbian, or transgender community members. And there’s lots of other ways rituals could be inaccessible and exclusive. Often this is done unintentionally; however, there is still an impact. I’ve said before that activism is sometimes saying the unpopular thing. Often, it’s standing up for those who do not have as much power in a dynamic, whose voices are not heard. In this case, the unpopular thing is the idea that we–Pagan leaders and ritualists–may need to change how we approach rituals in order to make our rituals more accessible and inclusive. We may even need to re-evaluate some of our dearly-held theological beliefs. If we want the dominant culture to change, to legalize gay marriage, support people with disabilities, eliminate racism…don’t we have to do that work first ourselves, within our community? This entry was posted in Uncategorized on July 21, 2013 by shaunaaura. My personal and professional life went a bit topsy-turvy on me this week and, despite many reminders relating to this post, it never materialized. Instead of putting something together at the last minute, I thought I’d take the opportunity to say a few words and invite everyone to do a little magic this summer. I’m not the only one with a lot going on at the moment. From the Fearless Summer campaign, to the Moral Monday protests in North Carolina, and to the work of activists opposing restricting a woman’s right to choose in Texas, there’s a lot of work being done out there. It’s arguable, that the pace of our activist lives quickened not recently but rather a few years ago during the 2011 Wisconsin protests regarding unionizing rights in that state. Or, maybe it was similar protests at similar times dealing with similar issues in Ohio. And it’s not just the United States. The last few years have seen Iran’s Green Revolution, the Arab Spring, and, more recently, protests in Turkey and Brazil as those countries come to grips with the constraints we’re all feeling on our day-to-day lives. And, most recently, Egypt. Again. You may recall that at the same time we were seeking to protect union rights here, Egyptians were working to oust the Mubarak government. They did so. But, the changes they sought were not to be found in the Morsi administration and so the people returned to the streets, and to Tahrir Square, to protest again. These latest Egyptian protests, in the end, resulted in violence as the Egyptian military and the supporters of the Morsi administration skirmished resulting in the deaths of (at least) 51 civilians. And whether you liked or disliked Morsi or his government or his religious beliefs and ideology, violence and death is never a good thing. Thankfully, things have not gone that far here in the US. Sometimes it all seems a little too big, a little too insurmountable, and we just don’t know where to begin. A teacher of mine once said: “We’re witches; we do witchy things” and perhaps this, at least, is something that we can all of us do. Whether you call it prayer or magic, whether it’s the intentions you carry in your heart or those that you share with others, whether you believe in gods or not, one thing we’ve learned is that we’re all connected. Take the time this summer to do some magic, offer some prayers, or do whatever your tradition, your beliefs, or your conscience asks you to do to help protect those who are on the front lines. And, to those of you out their risking yourselves, be careful and know that we’ve got your back. This entry was posted in Uncategorized and tagged egypt, moral mondays, north carolina, ohio, protests, texas, wisconsin on July 14, 2013 by David Dashifen Kees. This entry was posted in Uncategorized on July 7, 2013 by mcunha.